Well you weren’t going to go out tonight, but you went to meet someone in the early evening. So you had a couple of beers. Then another friend joined the group. So you had a few more beers. Then someone joined the group who was friends with the bartender. Suddenly it’s 10pm and you’re on your way to another bar suggested by another friend. You haven’t had solids for the last nine hours, and beer is sloshing about your belly and doing funny things to your eyes. It’s time to eat my friend. If you’re in the Raval, you can have kebabs, or kebabs. And if you’re like me, it takes exactly three mouthfulls to remember why you don’t eat kebabs when sober. If you’re in the Gotico there are a few options. On Carrer Dels Escudellers there is the famous Lechuga, pizza heaven to the discerning drunk. My new favourite however is on Carrer dels Codols. Turn off Placa Trippy (Placa George Orwell on the map) onto Carrer dels Codols. The first shop on your left is a kind of hybrid which looks like a kebab shop but serves chicken and rice, chicken and chips, samosas and a whole lot of similar combinations. The average price for food ranges from 3.50 Euros to 5 Euros. A bit too ‘street’ for your European sensibilities? Fine, keep walking. The next place on your left, marked by the internationally recognised red lantern is the Chinese restaurant. Fried rice, or a dish of rice and beef, or noodles and chicken, will set you back about 4 to 5 Euros. Gone are the nostalgic days of 3 euro chinese food, but still great value, and you can sit in and eat for no extra cost. Not in the mood for Chinese? Fine, Keep walking. 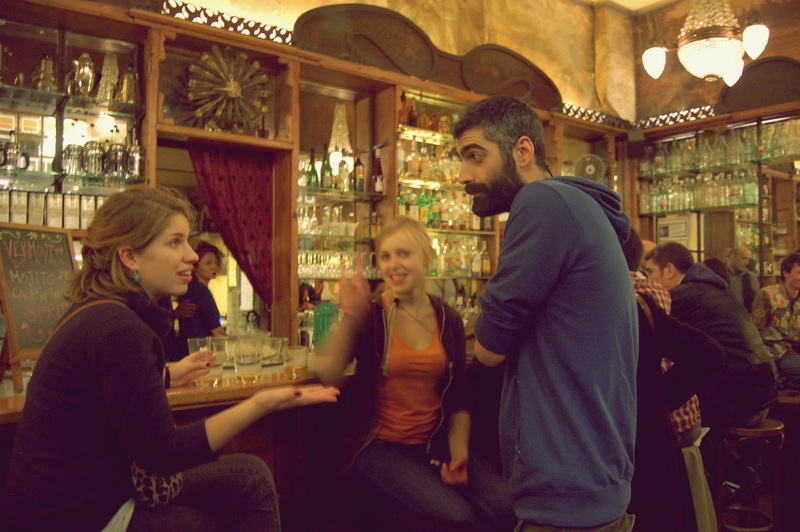 Peek into El Mariatchi bar on your right, and make a mental note to come back for a drink. And finally when you think the person who gave you directions was probably too drunk to think straight, you see it. Tuccos! Bohemian cafe chic, with big tasty food at street food prices? Yes! Yes! Yes! Past the front desk, and inside the long and narrow cafe are two food stations buzzing with activity. A little team of chefs are working hard, and more significantly…looking clean. Several tables are scattered through, with what even appears to be a large birthday party in progress in the back. The mandatory artist friend’s sketches are up for sale on the walls, along with spray painted skateboards and the perplexing message ‘I can’t stop’ forming a repeated theme throughout art in the restaurant. That isn’t Tuccos’ message though. 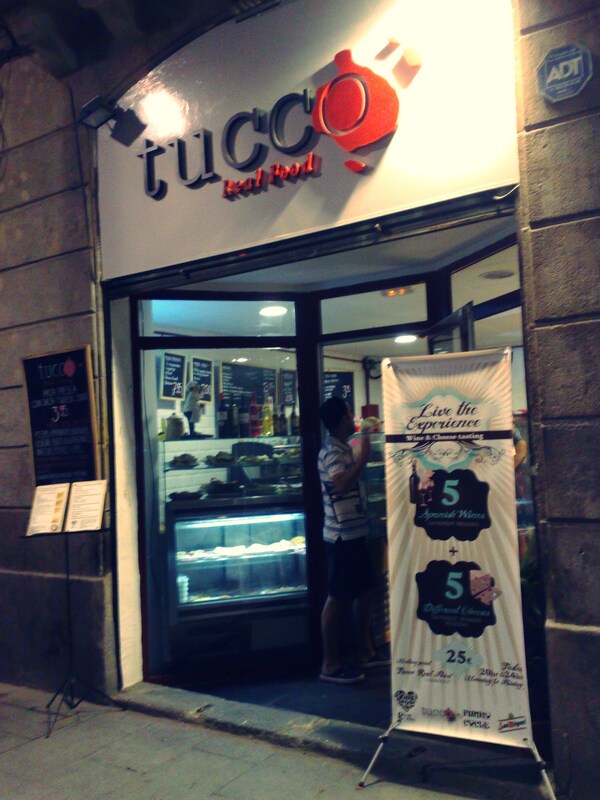 Tuccos’ slogan is ‘Real Food’. Hooray! I opted for a mini pizza (1.80 Euros) and a slice of dulce de leche, a kind of caramel cake (1.60 Euros). A good portion of lasagna would set you back 5 euros. Tuccos has just relocated to this new spot, and all the decor is fresh and crisp. Unfussy, but cool. The lady taking food orders at the front counter is patience exemplified, quietly explaining and waiting for large groups of tipsy people to muddle their way through the menu. Overall, the cafe had a great vibe. Silly cheap prices were just an added bonus. In fact, I’m going back (sober) today, just to make sure that dulce de leche really does taste as beautiful as it did last night. I’m all about thorough reporting.